Sabres' Jersey Leak The Real Deal? 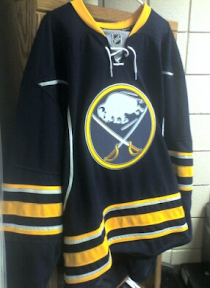 It would appear that leaked photo of a Buffalo Sabres jersey that's been floating around the web is the real thing. Just to be clear, I don't consider anything "official" until it comes directly from a team, but I do trust journalists and John Vogl of The Buffalo News wrote in his blog Sabres Edge that it has been confirmed — I'm assuming he means by the team. He also had a couple more tidbits we didn't previously know about. 1) The logo is the same color as the jersey, the darker blue. It only looks different because the different fabrics aren't reflecting the same. In case you forgot what it looks like, here's the jersey we're talking about. The Sabres are scheduled to officially unveil their new third jersey next Saturday, September 20 at Puck Drop 2008. I'll have complete coverage at that point right here on Icethetics. Thanks to Mike for the heads-up on this!